Jackson Township is not only the largest town in terms of square mileage in Ocean County but also in the entire state. The combination of its size and rapid growth has translated into a commensurate escalation in criminal, DWI, and traffic offenses in Jackson Municipal Court. If you were arrested or charged with shoplifting, marijuana possession, disorderly conduct, underage drinking/alcohol possession, simple assault, harassment or another offense, you certainly among many. The Jackson Township Police Department employees 82 full-time officers who are very busy making arrests, filing charges, and writing tickets. This “Gateway to the Jersey Shore” and home to Six Flags Great Adventure and Jackson Factory Outlets, consistently ranks in the top twenty (20) percent in the county in terms of indictable crimes of the first degree, second degree, third degree and fourth degree, as well as disorderly disorderly persons charges, issued in a given year. Matthew Dorry and the other attorneys at Law Offices of Jonathan F. Marshall routinely appear in Jackson Municipal Court. Prior to joining the firm, Matthew Dorry served as the prosecutor in Jackson and over fifteen (15) other municipalities in the county. The staff of veteran criminal defense lawyers at our office are prepared to invest their 100 plus years of experience and contacts to work so that the very best outcome of your charge can be achieved. To speak to a Jackson Criminal Attorney at our firm, call our Toms River Office anytime 24/7 at (732) 286-6500. The initial consultation is free of charge. 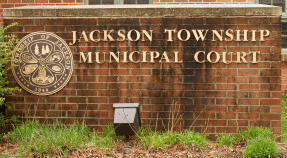 Jackson Municipal Court is a court of limited jurisdiction and it hears matters such as disorderly persons, petty disorderly persons offenses, town ordinance violations, and traffic violations. Disorderly persons offenses are commonly referred to as misdemeanors. The Jackson Township Municipal Court is located at the Justice Complex on 102 Jackson Drive, Jackson, NJ 08527. Our lawyers have been appearing in this court for decades on a wide range of charges including Driving While Suspended, Driving Without Insurance, Possession of CDS in a Motor Vehicle, Drug Paraphernalia, Lewdness and Criminal Mischief . The following is a summary of important information regarding the court. Many individuals are charged in Jackson with offenses that fall within the indictable realm. These are the first through fourth degree crimes previously described. Jackson Municipal Court lacks jurisdiction to decide felony cases like these and they must be handled at the Ocean County Superior Court. Heroin charges definitely make a big block of the 570 indictable offenses in the town in view of its inclusion in the top 20 towns in New Jersey for abuse of this and other opiate drugs. Other charges that arise more often than others include burglary, marijuana distribution, aggravated assault, cocaine offenses and eluding. If you were arrested in Jackson for any form of felony violation, you face the possibility of a state prison sentence that can range anywhere from 18 months for a fourth degree crime to 20 years for a first degree crime. Irrespective of whether your charge involves a motor vehicle summons or a serious felony, our Jackson NJ Criminal Lawyers have the qualifications to get you the result you need. We are not only highly experienced in defending just about all offenses set forth under the New Jersey Criminal and Traffic Code but also exceptionally familiar with the town and its municipal court. Mr. Dorry has even served as the prosecutor, interfacing with the police and court personnel in Jackson. All of the criminal attorney at the firm take every case very seriously and we will do what is necessary to make sure you walk away from this incident as unaffected as possible. If you would like to discuss your case with a member of our criminal and traffic defense team, call us at (732) 286-6500.